Grant Morrson has created a treatise, through his and artist Frank Quitely’s “Flex Mentallo: Man of Muscle Mystery”, on the influence and vital need of superheroes in the world. Through this work, Morrison lays before the reader the entirety of the rich history of superheroes. Despite not being physically in our presence, Morrison and Quitely convince the reader to believe that comic book heroes are as real as any human being on Earth. According to Morrison and this book, superheroes are a part of us and they are life. Superheroes are a religion or a mythology birthed from humanity’s imagination and subconscious (or conscious) desires. One must simply believe in order to reach fulfillment. In this book that begs for repeat readings (and rewards), Flex Mentallo is on search for his past ally, the “Fact”. Having been brought into the real world by creator and writer Wallace Sage, Flex believes his ally from the comic books has made it into the “real” world as well. To make matters worse, some possible terrorist organization calling itself “Faculty X” is planting fake bombs at different locations. Flex’s story occurs concurrently with that of Wallace Sage’s descent into madness. Is he on drugs? The journey of Flex and Wallace is one towards awareness and truth. Quitely understands Morrison’s mission with this book, and, as evidenced here and in their previous collaborations, they are a duo perfectly in sync with each other. Truth lies within the imagination, and what lies within every person’s imagination are heroes ready to save, inspire, or lift them up to heights they could only imagine. Morrison teaches his readers that the heroes we create are a part of us. The are us. Through the imagination, reality is birthed. As one of Wallace’s heroes tells him while they’re inside his brain, “Since we came to live in the imagination, we’ve been creating and transmitting certain ideas directly into your reality.” These superheroes are real and transform the world, despite what most of the world’s inhabitants tell themselves. There are heroes, and, as Flex Mentallo, in his search for his colleague the “Fact”, proves, these heroes are meant to be our world’s (as well as any alternate world’s) saviors. Morrison pays homage in this Flex Mentallo miniseries to the rich history, or mythology, of comic books and its different “ages” (Golden, Silver, Bronze, and Modern). The world may seem, as the reader reaches the Modern Age, a grim and hopeless place. The news media throughout the series teases the imminence of war. Flex, however, perseveres through even the darkest times. As Lieutenant Harry looks out onto a cruel rain-soaked world brought to vivid life by Quitely, Harry says, “I don’t believe in superheroes. They abandoned us to our fate. They all went away. 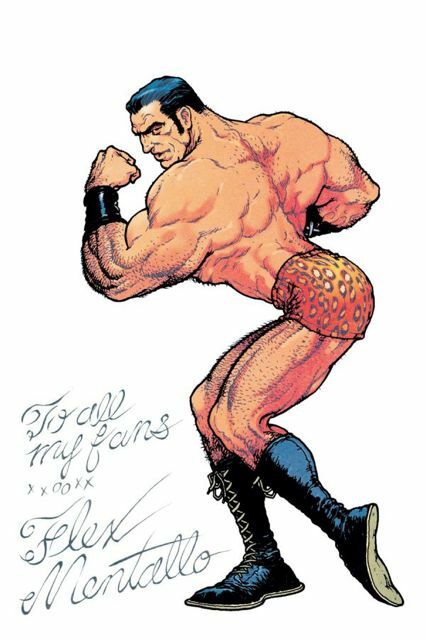 All but one.” Those final three words stand before the larger than life and imposing figure of Flex Mentallo. Here, and in each issue of the series, the credits page is a full page splash featuring the hero in true “comic book” form. Rain beats down on Flex’s raincoat and his visage belies a man resolute in his mission. Doom and insurmountable odds may surround him, yet the innocence of a hero shows in Quitely’s art. Flex is pure and exactly what the world needs, despite the dark Modern Age of comic books depicted in this issue (with visual homage expertly given to “The Dark Knight Returns” on the cover of issue three and its interiors): a hero to inspire hope and awe in hearts and minds. The scene with a male hustler in a public restroom is beautifully rendered by Quitely and colorist Peter Doherty and reveals the depths people will sink to in order to escape their world. They need heroes. The hustler’s eyes are a glazed blue and in awe of a drug he is about to inject called Krystal. It’s supposed to enlighten the user to the truth of all life’s possibilities. According to him, “You see reality for what it is…the imaginary story.” The reader observes the way the hustler perceives himself to be after taking the Krystal: a buff shirtless hero with a long yellow mane of hair. Quitely makes him cartoony, with a huge colorful “WHAAAM!” spelled out behind him in true comic book form. He bursts forth from chains like Superman would during any Age. He proclaims, “REALITY NO MORE!” and believes he has superpowers. He says that life is everything that he makes up and that he’s “cosmically aware”. 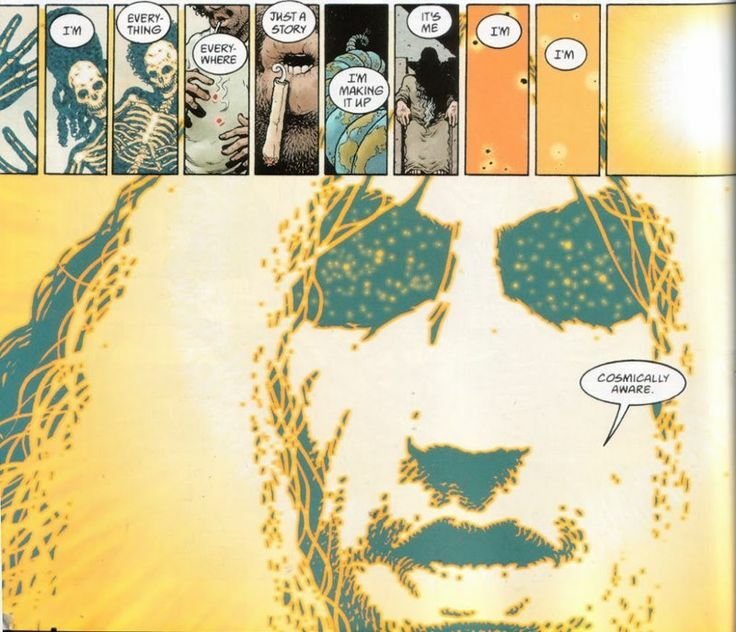 Quitely’s depiction of him here is truly “cosmic”, with stars in the hustler’s black holes that stand in for eyes. The hustler then watches with awestruck eyes, in one awe-inspiring splash page by Quitely and Doherty, as hordes of superheroes come down from the Heavens in perfect formation. They come as if in a wave to help the hustler, who now is kneeling on the ground with his hands in prayer. Quitely creates fantastical superheroes who look familiar and safe: they have arrived in time to save the hustler from what appears to be a city on the brink of utter collapse. Bright colored heroes contrast heroically with the despair of a dark world in ruins. He tells Flex (who naturally can’t perceive what the hustler is seeing), “they love us…they’ve always loved us…they’ve come to save us all. THEY’RE GONNA TAKE ME WITH THEM!” Tears heartbreakingly stream down the hustler’s eyes as he clings to Flex. A clenched hand drops in resignation and death in what appears to be a puddle of piss. The heroes have saved him and taken him away from a life of despair. Even in the afterlife, superheroes are there to comfort us. Pure inventiveness and imagination equals “Flex Mentallo: Man of Muscle Mystery.” Grant Morrison, along with artist Frank Quitely, colorist Pete Doherty, and letterer Ellie De Ville, have come together to tell readers and all of humanity that our imaginations are boundless and vital to keeping the world alive. Without imagination, there is no life or hope. 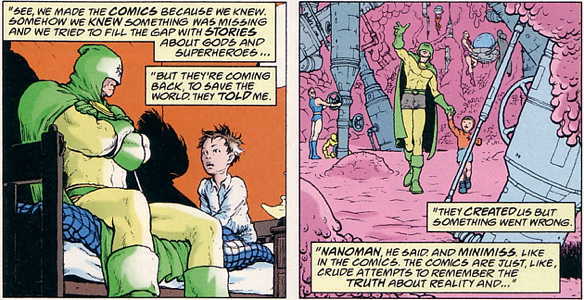 As Wallace reminisces about what a hero once told him, Morrison’s idea is also being reiterated: “No more barriers between the real and the imaginary.” Flex says it best toward the end of the story when he smiles that superhero smile and states, “All we can do is hope”: hope for humanity, hope for individual imaginations, and hope for the collective imagination. Without belief in superheroes and the ideals they stand for, all of humanity is truly doomed. Despite the dark days of this comic book age and the goings-on of the “real” world, heroes stand tall.